Fujian Province, China, 24th May 2013—The sentencing of three men in Fujian Province for their role in smuggling ivory to China from Africa has provided new insights into the scale and nature of the global illicit ivory trade in 2011, already the worst year on record. According to Chinese media reports, three men have been convicted for their role in the smuggling operations and received jail sentences of between 7 and 15 years. Over a six month period in 2011, one of those convicted, identified as Chen, was responsible for smuggling a total of 7.7 tonnes of ivory—representing an estimated 819 elephants—from Africa to China. At the time, Chen, from Putian City, managed authorized legal ivory retail outlets in Shanghai and Xiamen, Fujian Province. “This is the first example of the conviction of an accredited ivory industry insider for systematically attempting to launder illegal ivory into the legal marketplace on a grand scale,” said Tom Milliken, TRAFFIC’s ivory trade expert. According to media reports, Chen paid large sums of money to an accomplice named He to misdeclare the contents of the ivory shipments to Customs. He, who was sentenced to 7 years in jail, and Chen were both arrested in late August 2011. Chen was said to have purchased ivory from a third defendant named Zhao. Zhao was also arrested and sentenced to 15 years in jail. Two other suspects were named as sellers of ivory consignments to Chen. Chen’s ivory, sent in five batches—two shipments from Kenya, two from Tanzania and one from Nigeria over a six-month period of time—comprised a total of 2154 whole elephant tusks or segments. All of these consignments were seized following their arrival in China. Data on ivory seizures worldwide are compiled through the Elephant Trade Information System (ETIS), which TRAFFIC manages on behalf of Parties to CITES (The Convention on International Trade in Endangered Species of Wild Fauna and Flora). 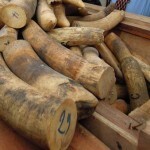 These seizures had not previously been officially reported to ETIS and brings the total weight of ivory seized in 2011 to a staggering 46.5 tonnes, a figure 2.5 times the average of 18.6 tonnes for the period 1996–2011. The previous worst year on record was 32.7 tonnes in 2009, which was preceded by the lowest annual total of 6.8 tonnes in 2008. “2011 was already the worst year for the volume of ivory seized since records were first compiled in 1989, but this new information puts the annual total into the astronomic zone,” said Milliken. The case appears to mark a major breakthrough by authorities in China in the clampdown on criminal syndicates behind the illegal smuggling of ivory to the country and raises a number of important questions as to the mode of operation of ivory smuggling to China. In particular, this case demonstrates that Chinese dealers are able to source ivory in Africa rapidly, with the ability to orchestrate successive large-scale illegal ivory flows out of Kenya, Tanzania and Nigeria. “Authorities in China are to be congratulated for this breakthrough, but must endeavour to follow up on every possible lead to ensure this ivory supply line between Africa to China is well and truly severed,” said Milliken.